– The food writing world lost a titan last week. RIP Jonathan Gold. In any case, hope you enjoy. This will conclude our reviews and original content for 2017, but we will be back in 2018. 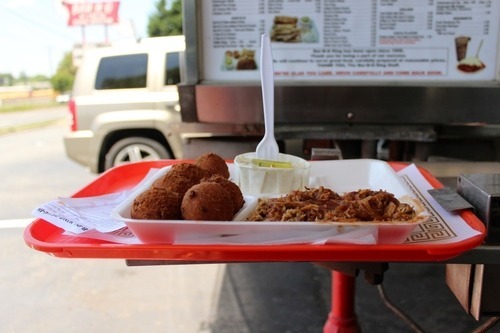 – In drier times (hopefully coming soon), could whole hog barbecue succeed in Houston? After coming in around 10 p.m., he spends the first two hours prepping the next day’s sauces and green beans. As he chops and mixes, Phelps is also building the fire up to the required temperature (225 degrees), in order to cook the two pigs nightly. By sunrise, he generally has around 350 to 400 pounds of pulled pork ready for the day crew. While the trio don’t date back to Parker Barbecue’s opening in 1946, they have been a part of the iconic restaurant on U.S. 301 for more than a century collectively. Williams joined the staff in 1963 as a waiter before heading into the kitchen to cook ‘cue alongside one of the original owners, Ralph Parker. He stepped into an ownership role in 1987, eventually bringing Lamm and Lippard along for the ride. 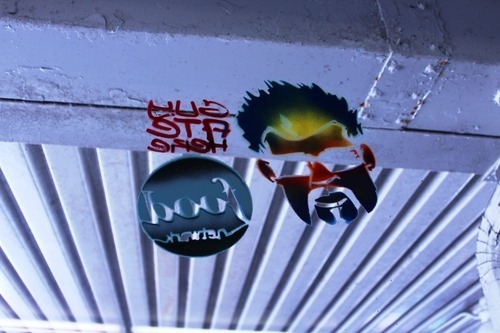 Lippard started working in the kitchen in his twenties while Lamm started in 1985. 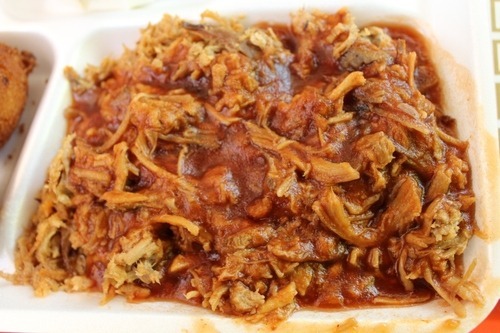 Monk: Bar-B-Q King in Lincolnton (not to be confused with the drive in of the same name in Charlotte) is one of those joints I’ve always been somewhat aware of but haven’t ever made a point to go to. After checking it out recently on the invitation of Jordan, a son of co-owner Keith Smith and the social media manager, I wish I had gone much sooner. At the lunch hour on a Monday, a steady stream of locals are usually lined up several deep at the multiple register counter. “Hollerin’ orders” has apparently been the longtime system to communicate orders in the kitchen and was certainly the first time I’ve ever witnessed anything like it. In case its not evident in the name, as customers order at the register their order is literally yelled from the order taker to the kitchen staff who then acknowledge the order and begin putting it together. It’s surely a sight to see. That alone would be worth the visit to Bar-B-Q King but thankfully the barbecue more than backs it up. They smoke their pork shoulders daily over hickory coals and hand chop the pork each morning. I would call their style pretty closely aligned to Lexington-style, though they do offer a white slaw option. The sandwich I got was fantastic – the chop was not too coarse, the pork was tender and smoky, and the red slaw accentuated it all perfectly. 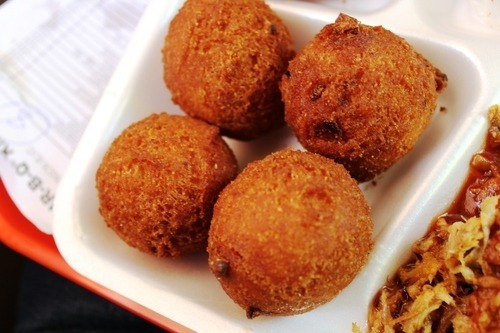 The house-made hush puppies were quite good and the onion rings are their best selling side for a obvious reasons after tasting them. Had I not been checking out another joint an hour later I would have gladly finished both of them and left completely stuffed. 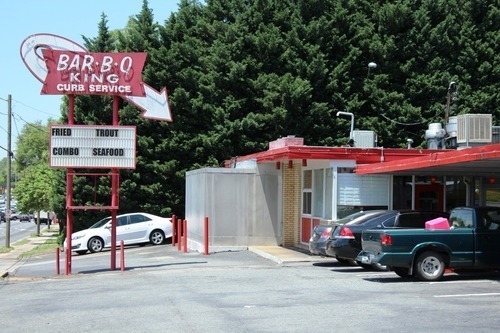 Last fall, Bar-B-Q King celebrated its 45th anniversary, so I can imagine that it’s quite an institution in the town of Lincolnton – and rightly so. If Jordan, who took me on a tour of the smokehouse and kitchen, is any indication there are quality people behind the joint who work hard to put out a great product six days out of the week (closed on Sundays). Lincolnton is about a half hour down highway 150 from Shelby and Barbecue Bros fave Red Bridges Barbecue Lodge. 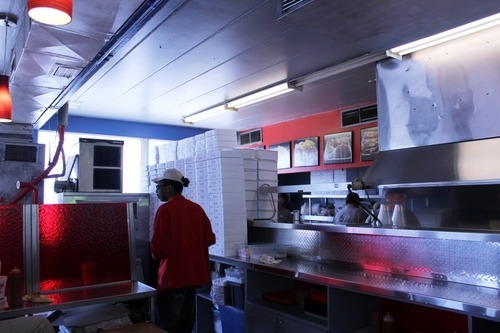 In my book Bar-B-Q King is nearly as good, which longtime readers of the blog will know is high praise. Get yourself to Bar-B-Q King in Lincolnton. Bar-B-King is a drive-in on Wilkinson Blvd in West Charlotte and you’ve passed it if you have ever headed to or from the airport. Having myself lived in Charlotte for over 9 years, I must have passed it a hundred times. 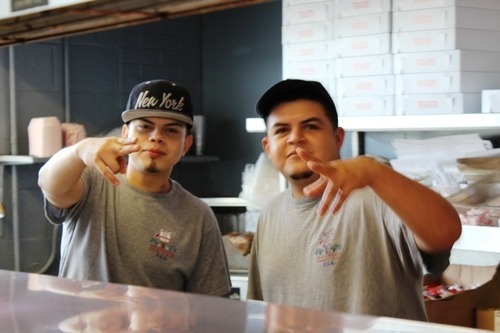 They’ve been there since 1959 serving barbecue (among other items such as burgers, hot dogs, and fried seafood). Admittedly, it’s been a few years (probably even more than that) since I’ve been to a drive-in, but I enjoyed the heck out of this experience. The barbecue comes pre-sauced and isn’t all that smokey. The sauce slathered on top is slightly tangy, thick red sauce. I probably would have preferred it on the side, but I understand that the meat isn’t spiced or rubbed (h/t Marie, Let’s Eat!) so it might have been a little plain without it. 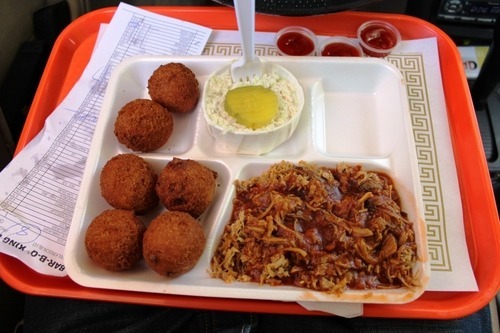 The hush puppies were huge and I dug them quite a bit, even though I couldn’t finish the generous portion they gave. The slaw is white and came with a pickle on top. After my meal, I stepped out of my car and took a few photos (as I do), and the carhop noticed and invited me inside to take a few more photos. And the guys inside couldn’t have been nicer, allowing me to take a few photos and even a couple graciously posing for me. 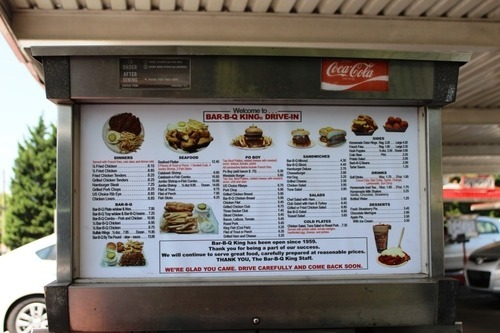 Bar-B-Q King isn’t essential if you are looking for Charlotte’s best barbecue, but it’s a neat drive-in experience that is worth checking out before the drive-in itself possibly becomes extinct in the coming years.